Juli D. Revezzo is a Florida girl, with a love of fantasy, science fiction, and Arthurian legend, so much so she gained a B.A. in English and American Literature. She loves writing stories with fantastical elements whether it be a full-on fantasy, or a story set in this world–slightly askew. 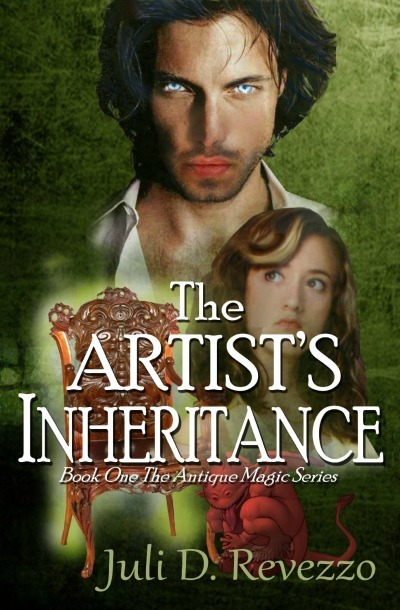 She has been published in short form, and recently released her debut novel, The Artist’s Inheritance. She also has an article and book review or two out there. But her heart lies in the storytelling. 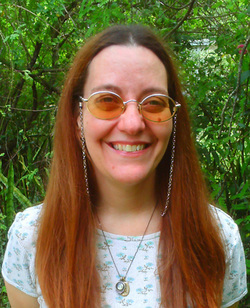 She is a member of the Romance Writers of America, the Tampa Area Romance Authors, and the special interest RWA chapter, Fantasy, Futuristic and Paranormal.When not blogging, and she’s writing and always has something in the works, be they revisions, or plotting her next romance or epic fantasy saga that ate the world, ;) or what have you. Trevor and Caitlin were once happy newlyweds, profiting from Trevor's art. Until Trevor inherits his brother's house, and with it, his part of an old Welsh family curse. Now, Caitlin will stop at nothing to save her beloved husband from insanity and suicide, even if it means she must embrace her destiny and become a witch. Something terrifying stalks Caitlin and her beloved Trevor. Something the bits and pieces she left claimed she had to make sense of or so legend says. When the curator of their collection finds Caitlin's long forgotten diary, she wonders will it tell the whole tale? Will it tell why Caitlin seemed so determined to tell the difference between reality and nightmare even as she continued the fight to defend her family from evil? Will it explain why she thought her world twisted? If she really became a witch? What will the holidays hold for Caitlin? Perhaps the answer lies between the lines of her story, one of lessons, struggles, and the hopes she carried like a warrior's shield. Life is good at Starfort Collectibles until the owners, Caitlin and Trevor Fulmer, acquire a beautiful statuette with a murky past. Shortly thereafter, mysterious hauntings wreak havoc on the couple when a ghost in the attic threatens retribution. Caitlin presses her coven for help before the ghost succeeds in meting out deadly punishment -- on Trevor.